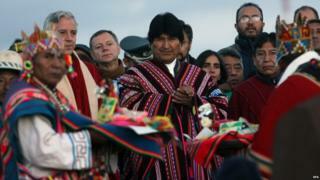 Bolivian President Evo Morales has apologised for joking about the possibility of Health Minister Ariana Campero being a lesbian. He said he had no intention of offending anyone and respected sexual diversity. Ms Campero, a 29-year-old doctor, has been the subject of similar comments by other senior Bolivian politicians. Mr Morales made the comments during an official ceremony in the northern province of Beni. He noticed Ms Campero was talking to another woman and was not paying attention to his speech. Mr Morales interrupted his speech and said: "I don't want to think that you're a lesbian. Listen to me." His comments prompted reactions from gay and lesbian organisations in the Andean nation. "And if the minister was a lesbian? What would be the problem?" questioned Bolivia's Network of Lesbian Women pressure group. Mr Morales issued a statement saying he apologised "humbly and sincerely" if he had offended anyone, adding: "We respect diversity and that is clear in our constitution." Bolivia has a gender equality law and many women occupy high-profile political posts. But they have on several occasions had to deal with sexist comments. Ms Campero was told by Vice-President Alvaro Garcia during a recent event to "get married". In March, the mayor of a small town said during a rally that she should move in as a maid. She responded by tweeting a picture of bisexual Mexican painter Frida Kahlo and a message: "I won't be silenced, I won't be submissive. It's a pity that there are still sexists in our ranks."